Poker Mutant is sad. After promising myself that I was going to play this event very ABC, I managed to screw it up and go all-in before the first break. I took the poison pot with a small raise right off the bat, then played mostly quality hands, managing to pick up some chips with an early AxAx then a set of fives and then losing some hands when I folded after uncooperative flops. I was skating down around 3,000 chips about an hour into the game when I was on BB with seven players in the hand and 6♣9♣. Two clubs and a six on the flop held me in through the river when I made my flush, and the number of people in the pot from the start made it big enough I was up over 5,000 by the time it was done. I think I started getting a little squirrelly when I found myself calling a post-flop all-in from a shorter-stacked player that would have cost me about two-thirds my chips if I was wrong. I counted it out and pushed in the chips, he flipped over AxQx and so did I, so we split the few hundred chips in the pot from the blinds and earlier callers. My last hand went wrong when I bet 1,200 post-flop with AxJx. The flop was Ax4x5x. Two players got out of the way, but a player who’d been moved from a broken table just a few hands earlier put out enough ping 500 chips to put me all-in. I called, and he flipped over the AxQx, which held through the turn (4x) and river (2x). That was the last hand before the break. Ninety minutes. 171 entries, 35 players receiving tickets to the Main Event. My best results in tournaments have been at Encore, and I was hoping this game would give my bankroll a little boost before the summer tournament season got into high gear. But like the last Encore $25K, I was gone early. I quickly lost 450 playing 6xTx, hitting the ten as the high card on the flop and going up against AxTx. Just fifteen minutes into the game, I called 600 with JxTx and folded to a bet and eventual all-ins on the 4x9x3x flop. Kx turn card was the one the eventual winner wanted to see, because it gave him a higher set than the 9x9x of the original bettor, but Qx on the river would have made my straight the best hand. I stuck it out to the end with straight and flush draws on 5♥8♥ but didn’t get there, and twenty minutes into the game I was already down to 9,300. I slid another 1,100 down the drain with Ax2x drawing to a wheel. Ax2x on BTN lost me chips again when I two pairs came on the board but my opponent made a full house with a full house. Half an hour and I was nearly 5,000 chips. Finally, I won a pot with K♦T♦, hitting two diamonds and a ten-high flop, with another diamond on the turn, gaining about 2,000 chips. I bided my time and lost the ground I’d regained with a missed nut flush draw and A♠9♠. Then I busted a short(er) stack with 8x8x against AxQx, turned around and lost 1,200 on the next hand calling with Jx9x. I hit middle pair but folded to a post-flop bet. Even with the knockout I only had 8,725 chips just before the first hour ended. Right on the hour mark, I was BB and picked up KxKx. There was a raise and several calls ahead of me but I wanted to get value and just called. Unfortunately, while the flop gave me top set, it was entirely diamonds. A player at the other end of the table bet 1,000, SB called, and I shoved with about 7,500 left, hoping that I might scare off a weak flush or flush draw, or that I could catch a board pairing to make my full house. The original post-flop bettor folded but SB called with A♦9♦, the last two cards didn’t pair the board, and I was out on the hour. One hour. Alternates were still being seated. I took the poison pot on the first hand with 5x7x, making two pair by the turn. I bet 200 and got two calls. Two queens rolled out on the turn and river, counterfeiting my fives, but my two pair was still the best and I won. Called 250 pre-flop with J♥8♥ and called the re-raise to 450 but with a 9x8x6x flop I folded to the next bet. A 3x4x in the BB made it to the flop and paired the four. Suited cards started to show up and by the river I had a baby flush with the trey. A small bet seemed to be enough for everyone else, because I won. All that, and a dozen minutes into the game I was up a grand total of 300 chips. Then I got KxJx and blew 1,150 drawing for a queen to make Broadway, putting me down 900 from the starting stack twenty minutes in. With 5x5x in SB, I called a 150 bet post-flop but folded after the turn when there were four overs. I got a little of it back with KxJx, betting at a Jx2x2x flop. I was sliding, though, with 6,050 at the half-hour mark, and 5,650 five minutes later. With J♣2♣, I called a pre-flop raise to 250 along with three others. The flop was Ax3xAx and I bet at it, bluffing everyone off the hand. Called a 250 raise with 3♦6♦ and got an open-ended straight draw with a flop of Kx4x5x. Went out on a limb calling a post-flop re-raise of 1,750 but was rewarded with a 2x on the turn. I shoved and was called by Kx8x, which finally put me over the starting stack again, with 13,750 at 50 minutes into the game. Taking notes on that hand, I didn’t notice action come around to me on the next as BTN and I was flustered enough by the two all-ins ahead of me that when I looked at AxKx I folded it rather than get into what looked to be a bloody battle. I figured it was likely a couple of players had aces, I would have been putting most of my stack (if not all) at risk, so I thought not. I should have throughout it through, better, though. As it was, none of the players had premium hands, none of them had anything higher than a king, and it was a pair of kings in the hand of the guy I’d just doubled up against that took the pot. I’d had all three stacks covered. My ace kicker would have taken out three players. Another instance of failing to pull the trigger. I called 1,100 with Qx9x but folded it to a post-flop bet, then put in another 825 on K♠3♠ to call a raise and had to fold to 2 all-in pre-flop bets. Raised to 600 from BTN with A♦3♦ and got called by the blinds to see a 8x7xQx flop. A bet of 700 won the pot and put me at 12,700 just past the one-hour mark. Then I lost just about everything with 8♠T♠ when my eight paired the top card on the board and I fell to a set of fives. I was done in when AxTx called my all-in with AxJx. One hour and twelve minutes. 21st of 27 entries. Karina Jett’s mention of a weekly HORSE tournament at the MGM Grand during the Tulalip Poker Pro Challenge last weekend got my juices flowing for some mixed-game action this week, and since there’s nothing in town I turned online for my fix. I took my first pot in the second hand, with A♦5♦ as UTG3. I made the first raise, to 40, getting calls from BB and UTG. The flop was an unpromising Q♣7♦Q♥, which got checked, as did the Q♠ turn. I had a very beatable full house with the 5♠ river and called a bet by the BB who just had 8♣J♠. I lost my gain on the next hand when 2♦A♦ failed to connect with 4♠5♣8♠ and make a straight by the river, then had to fold 2♥2♦ post-flop after calling a raise. 5♠5♦ on the fourth hand didn’t pan out, either. By the time I folded my first hand pre-flop (4♣9♣ on the BB), I was down to 850 chips. The next hand was the first of Omaha Hi-Lo and I had what for me was an interesting 2♥9♠6♣7♥. I had two pair on the 7♣A♣9♦ flop, but never got all of the pieces needed to connect a straight and folded after the river. Another sort of oddball hand was next: 4♠5♦5♣2♥. All eight players at the table saw the 3♦5♥A♣ flop and I’d made the wheel straight along with the lowest possible hand and potential for quad or a full house redraws. Two players dropped out in the post-flop betting that went up to 120 chips from each player, then the Q♣ came on the turn. Bidding went up to 240 this time, with one player dropping out, then the same happened after a 9♠ on the river. No flush possibilities, no full houses, the wheel was the best possible straight. Only one of the other three players had the straight; we chopped the money for the high and low pots; about 1,600 apiece. My next hand was 9♣9♠T♦T♣ as HJ. The pot was raised by UTG, then CO, then SB, and I called each time. I started the hand with 2,215 chips; only two of the other players had more than the 1,000 starting stack, and there were a couple of players who were seriously short, which was to my advantage in this hand. The flop was 2♦Q♥4♦, nowhere in my range and not the right color for my only potential flush. Action checked through to UTG, who made the first post-flop bet, then it was raised again by the smallest of the stacks in CO, re-raised by SB, and raised again by UTG. CO was all-in after calling the last raise. Four players made it to the river, with everyone all-in except for me. The turn and river were J♠ and K♥, so there wasn’t a low. I took the side pots for a total of 1,585 chips with my king-high straight, the smallest stack on the table had an ace-high straight and took the main pot but since he’d started with just 215 chips, it was only 1,530. Two players were knocked out. We switched to Razz on the next hand and I folded my first three deals. On the fourth hand I got 5♥3♥4♦ and called a completion to 50 as fifth to act. Three players went to fourth street, one showing 5♦Q♣ and the other with A♣3♦. Everyone checked. There weren’t any more bets until seventh street, by which time my promising hand had turned less lovely with a 9-7-5-4-3 low. Not exactly a winner. The other players had 5-Q-7-5 and A-3-J-8 exposed. The latter of those players opened with a 100 bet and I called; the other player folded, and lo and behold I was the winner because the other guy had two pairs in his hand, making the jack the top end of his low. I went as far as fifth street on the next hand, but that was the last of Razz for the moment. I started Seven Card Stud with 3,210 chips but didn’t play a single hand through to seventh street and was down to 2,820 by the time we started Seven Card Stud Hi-Lo. I had a slight chip advantage over two other players over 2,500 chips, and the rest of the table was under 1,000, with antes at 15, bring-in at 30, and limits of 150/300. My first hand was A♦3♥9♦ and I decided to try for the low. It was cheap, I just needed to call the bring-in to see 8♠ on fourth street. The other players in the hand were showing 7♦3♠, 3♦4♦, 3♣Q♠, and Q♦7♠, and a couple of those gave me pause on the low. I decided to bet at it and managed to cut the field down to just two other players, one who was nearly equal to me in chips and the other who’d begun with fewer than 400. The next card for me was 7♣. My larger opponent was now showing 7♦3♠6♠ and the smaller had 3♦4♦5♦. Things looked even worse now. I picked up a J♦ and 2♦ on the last two streets and called bets of 300 on each. Perseverance paid off, this time, my 8-7-3-2-A low bested anything the other two hands had and I took half the main and side pots for 1,582 (a net gain of only about 270 chips, though, since a lot of them were mine). The larger of the two stacks actually lost some ground, with a portion of their chips going to the small stack in the main pot. I folded two more hands then played a J♦9♣Q♥ hand to seventh street. Action on the hand was cautious, everyone was checking through, and with nothing better than a pair of nines and J-9-7-6-3 for a low, I folded to a bet at the end. Ditto for a hand with just a pair of visible twos and unpromising low possibilities that I folded to a bet on sixth street heads-up. Then it was back to hold’em, with 2,507 in the bank. Several hands in, I min-raised to 400 UTG with A♥2♥ getting calls from HJ and SB. The flop gave me the flush draw with 5♥T♦6♥, but I checked it after the SB and HJ pass on the opportunity to bet, as well. Q♦ on the turn got a pass from everyone and so did the 4♠ river. I had nothing but that was still the best hand: SB had 9♥J♥ for the lower flush and an up and down straight draw; 8♣9♣ gave HJ a double-gutter straight draw. My ace-high was worth 2,000 chips. I lost some of that as BB with Q♠4♠ in a battle of blinds that began with a 7♣3♠8♥ flop. I called a post-flop bet of 200 from SB, then when the K♠ on the turn slowed him down, I bet 400 and got called. We both checked the 4♦ on the river (my only connection to the board) and he turned over 7♠J♥ to win 800 of my chips. I raised to 400 from HJ a few hands later with 3♥3♦ and was rewarded on the 3♣9♠A♥ flop. I checked it, then bet 400 after the 9♥ showed up on the turn. My sole caller folded and I was back up to 3,307 chips. Another heart-suited ace (A♥8♥) on my next hand and I raised to 400 from UTG2, getting calls from UTG and UTG1. All three of us checked through the 6♦J♠5♣ flop, but I bet into the J♦ turn and UTG1 folded. UTG and I both checked the 4♥ on the river, and fortunately my kicker was slightly better than his 7♦A♣ so I won the 2,300 pot. The next hand started with 4,807 chips and K♣Q♠ but it was ugly. I called a raise from BB to see the 7♣6♥2♦ flop, called another bet of 200 post-flop, and even called a 400 bet after the 5♥ turn. Why? I don’t know. I folded to a 400 bet on the 9♥ river and my opponent showed A♠A♣. What was I thinking? Down 1,000 chips. Q♠K♠ on the next hand did me okay when I bet the 2♥6♥K♦ turn and got the only other player in the hand to fold. Then we were back to Omaha Hi-Lo. I was BB at 125/250/25 with K♠5♣6♠9♥. UTG raised to 500, getting calls from UTG2, SB and myself. The flop came out K♣5♥T♥ and I was hooked. I bet 250 and the other three called. The same thing happened on the 4♦ turn. K♥ on the river gave me the second-best full house, with no now possible, and I bet it again. This time only SB called, showing 8♥3♥2♥J♠ for a flush but not beating me. A couple hands later gave me 6♠K♦A♥K♥, which looked pretty good for a high. I raised to 500 from BTN, getting called by both blinds and HJ. The flop wasn’t exactly what I was looking for but everyone checked it and the 9♥ turn. 3♦ on the river didn’t seem to be anyone’s favorite, either, and with no possible low, when the cards turned over, my two pair was the best hand, escaping defeat with a 15% chance on the river. Everyone else had straight draws or full house draws by the river; the only three cards that kept me from losing were the other threes. That hand put me up to 9,657. The next hand I started with a commanding leadoff more than 7,000 chips over my nearest competitor at the table. One of the players was all-in for just a portion of the ante. My cards were 8♦A♠6♣3♣ and I called the 250 big blind from CO along with everyone but UTG. The K♦7♣T♥ flop gave me an inside straight draw. UTG2 bet 250, which I called, then BTN raised to 500. SB, UTG2, and I all called and saw J♣ on the turn. I still had the straight draw—although it didn’t look as nice with the possibility of the high straight—and a flush draw. Everyone checked it through, so I didn’t need to make a decision at that point. The river card was 9♠. SB and UTG2 checked to me, I bet 500, BTN raised to 732, and SB and UTG2 folded. BTN may have misread his hand; he had Q♦7♦4♣Q♥ for just a pair of queens but he might have thought he had a straight. The stack that had started out with 10 chips in the ante had 9♦9♥K♥Q♠ and did have the king-high straight to take the main pot, but that was only 80 chips. No low again and my ten-high straight won the side pot of 5,069, knocking out the player in BTN. With over 13,000 chips, I had more than six times my nearest tablemate, and there were a couple of players with fewer chips than the combined big blind and ante of 275. The BB on the next hand was all-in for less than his blind. I had J♦K♠7♣2♦ and could easily afford to call the unraised blind to see the 4♦9♣K♦ flop. SB and UTG1 checked to me, I bet 250, and was called by BTN and UTG1. The 8♦ made my flush I bet 500, getting a call only from UTG1, who may have been chasing a low, because my bet at J♥ on the river made him fold. My only opponent at showdown was the all-in player, who only had two pair. I took both pots with my flush and was over 15,000. Things went much the same on the next hand. I had K♦7♦4♠4♥. None of the remaining five players at my table had more than 1,070 chips. UTG called the 250 blind (even though there was nobody to post it in full), I raised to 500, and UTG called, putting us heads-up for the side pot (the main had only 240 chips). The flop gave me some hope for my flush, with 5♥J♦T♦. UTG and I checked it and a 3♠ hit the turn. 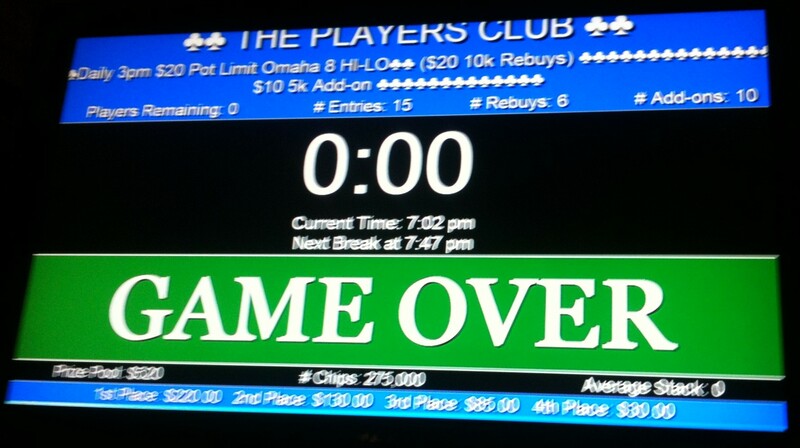 UTG bet 500, which I called, then the 9♦ on the river made my flush. No low, and unless he had the A♦ and another diamond or Q♦8♦, I was going to take this pot. He threw his last 70 chips into the pot and I called. He must have been going for the low or a straight with the 4♣K♣3♥2♠. The other all-in player had a great flop with two pair but it didn’t improve from there. They were both knocked out, and I had 16,544. We were down to five at the table on the next hand, which was even freakier. The dealer button was dead, I was UTG, and the players after me had 1025 (UTG1), 1021 (HJ), 740 (CO), and 1,026 (BB) respectively. My hand was a lowly 4♦2♣2♥3♦, so naturally my first action was to raise to 500. UTG1 raised to 750, HJ called, CO wisely stayed out of the hand, and BB shoved all-in. I called the extra 426 and UTG1 and HJ came along for the ride. The J♠6♦2♦ flop gave me some great straight possibilities and even put the potential for a straight flush in play. I already had a set of deuces, so full houses were in the cards (so to speak). I bet 250, which put UTG1 and HJ all-in for less to call. All the hands were flipped and everyone was seriously behind. UTG1 had Q♣7♣Q♠J♣, HJ was holding T♣2♠9♥T♦, and BB had J♥5♥K♥7♠. The nail went into everyone’s coffins with the turn’s A♦. The A♥ on the river that made my full house was unneeded. Three players went out, I was up to 19,600, and the game switched back to Razz. After the drama of the Omaha segment, I was mostly quiet in Razz, never going beyond fifth street and dropping about 1,000 chips in antes and bets. I was still the chip leader moving into Seven Card Stud and the table had been filled back up, but only one player had more than 10,000 chips and several were very short. I was dealt 9♠6♥4♣ as first to act and called the bring-in of 100 against a visible 2♥. None of the other players called, and I got J♦ on fourth street, against the bring-in’s J♣. We both checked, and I was dealt 2♦ for fifth street. I bet 800, which more than covered the bring-in’s stack and he folded. My next hand was a little less of a bluff. I started off with T♣J♠Q♣. Second-to-act called the bring-in, and I completed to 300. The bring-in (showing 2♥) called, and second-to-act (8♥) came along. Fourth street paired my ten with T♥. Both the other players checked to me and I bet 400. This time, only the bring-in called. I got T♦ on fifth street and for some reason I can’t comprehend I checked it through; bring-in got 9♠. With 5♥ for me and 6♦ for him on sixth street, my 800 bet stopped the hand and I was up over 20,000 chips and in the top five of the game with a thousand players left. I got cocky and played a hand out much farther than I should have. Where can something like 4♦A♠Q♠J♦6♦4♠6♥ go? What did I think I was drawing to? Anyway, it cost me about 3,000 chips. I lost another 1,600 looking for a third seven with pocket 7♠7♦. Two pair wasn’t good enough for the high in the first hand of Seven Card Stud Hi-Lo, costing me about 1,700 more. I’d lost the table lead by the time we were several hands into Stud 8. I got 4♦5♠K♦ as last-to-act. Bring-in was the table chip leader, showing 6♣. Second-to-act, one of the other larger stacks (A♦) called the bring-in and I joined. 2A got a Q♣ on fourth street and bet 500. I called with my measly 6♥, thinking maybe I’d be looking at a low or possibly a straight. Bring-in got my 5♥. With a 3♣ on fourth street, 2A pushed the idea of a club draw with a bet of 1,000, but he couldn’t shake my paired 5♣ or whatever bring-in had with 2♠. 2A picked up the last of my fives with 5♦ on sixth street, I got one of his clubs up—7♣—making an open-ended straight draw, and BI open-paired with 6♠. 2A tried to shake us off with another 1,000 bet but we both stayed. My down seventh street was 4♣, making a rather anemic two pair. Fortunately, neither of the other players bet at the hand, and when we showed, 2A had started out great with a pair of aces, but nothing else had paired, and the sixes were all BI had, so my fours and fives took the whole 8,155 pot. I stopped betting on the next hand when there were two fives showing in the other guy’s hand by fourth street. He got another on fifth and apparently knew that if he bet at the pot I was just going to fold. We got to seventh street and he showed his quads (the fourth on second street). A couple hands later we were back to Hold’em and I was dealt A♥A♠ as BTN. Is there any better position? 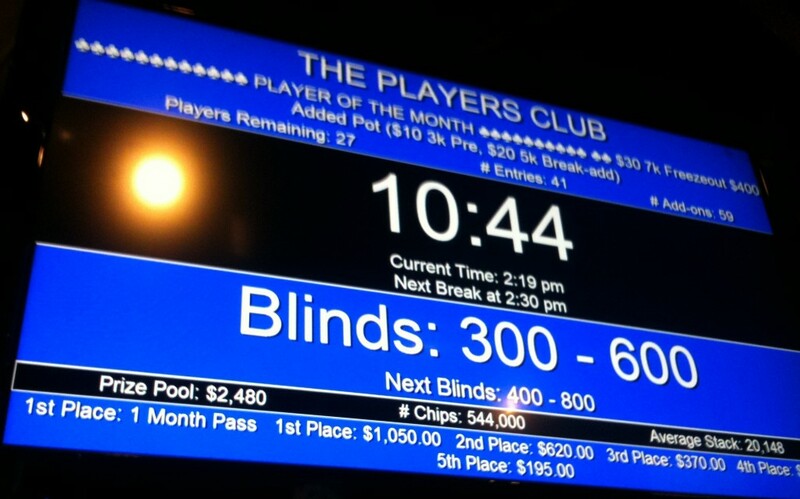 Blinds were up to 300/600/60. I started off with about 18,000, there were a couple other stacks over 15,000, then the others were about 5,000 or less. UTG2 called the blind after folds from UTG and UTG1. I raised to 1,200 and it was a heads-up raising battle between me and UTG2 until we’d pegged at 2,400 pre-flop. The Q♠5♣5♥ flop could have given him a better hand, but since he’d started with less than a third of my chip stack, I was willing to see things through to the river. He opened post-flop with 600 and I raised to 1,200 but he just called, and a 4♣ hit on the turn. He started betting again, I re-raised to 2,400, and he went all-in, showing 7♣6♣ for an open-ended straight draw and a club flush draw. The 6♥ river card prevented either possibility and he was out. I had about 25,000 chips for the next hand. I folder the next three hands, then played 7♠K♠ to the turn before folding. I made a big mistake playing 7♦6♠ from the SB hitting middle pair on a 6♥7♠T♦ flop and hoping it was best through several rounds of betting all the way to showdown when a A♠T♣ won. That shaved off 4,000 chips or so, and I folded my last couple of Hold’em hands. 6♥3♠3♥3♦ should have been folded pre-flop, not played to the turn. I took another couple hands (like A♥7♥K♥J♠ to the flop but no further. With blinds at 400/800/80, though, aborted stabs at the pot were costing big, and I was getting down below 4,000 chips by the time the Omaha 8 segment was over. In Razz, my second hand was a deceptive A♦3♥K♣ and I made a full bet of 1,000 instead of posting the bring-in. Two players called (showing 7♣ and 6♣, respectively) and I picked up 2♣ on fourth street, with A♣ and 9♠ for my opponents. They checked it to me and I bet 1,000, with both of them calling. Fifth street paired me with 3♦, putting 5♣ and 4♣ on the other two hands. I was down to fumes. I put my last 1,346 chips in play and got called by both of the other players. Amazingly enough, even though I was paired again on seventh street, and my low was a stunning K-8-3-2-A, both of the other player had worse luck on their draws, with one player actually having a pair and a set by the end. It gave me a much-needed shot. I made another big pot in Razz with 5♦J♣A♣ against a visible 7♣. I just kept betting and ended up with a 7-5-4-3-2 against a much larger stack that had 8-7-6-3-A. That pot put me back up over 20,000. Three of us got to showdown in the next hand. I had three cards under 7 to start with, ending up holding 8-6-5-2-A against T-7-6-4-3 and 9-8-6-2-A. We switched over to Seven Card Stud and I took my third pot in a row, besting sixes and fives with tens and sevens, and pushing over 32,000. Then I blew out most of it going to the mats with a pair of visible kings against a guy with one king showing and another below, who had the top three pairs in his hand before he was done. Lost some more with two low pairs that were beat by aces and fives. That cost me 12,000 chips in one hand. A bet after a pair of visible aces picked up a small pot, then I somehow managed to win a three-way showdown with just a pair of jacks. Nines and sixes scooped the 25,200 pot in the first hand of Seven Card Stud Hi-Lo, then I lost a chunk calling to get a straight to fill out but losing to aces and nines. My next-to-last hand started off beautifully, with 9♦6♦T♦ and only J♦ showing on third street. Could I get a straight flush? By the time A♦ came on sixth street, I was just hoping for any other diamond—only three diamonds were visible in the hands of the three other players—but the best I could do was another ace on seventh street. That wasn’t good enough. Aces and sevens took 35,000 chips in the two side pots, with no lows, the main pot of 28,000 was scooped with a six-high straight. That left me with just under 5,000 chips. I was all-in by fifth street, but a pair of fours bookended by a king and a jack left me beat by a pair of sevens and without a low to my name. It didn’t get me to the money—the Carbon Poker free rolls only pay the top 20 finishers—but I was in the top 5% of the entries, which beats my best previous showing of 178th. 103 hands, 106 minutes. 120th of 2,757 entries.